All our surpluses and energy as a social enterprise go to the work of our therapeutic garden. You can see the original Muddy Boots garden gallery here. 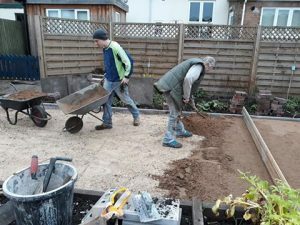 We are busy ‘prepping’ our garden equipment and cultivation plans for the 2019 Summer and Autumn seasons. We look forward to seeing all our volunteers, visitors, old and new, as well as new friends to come in the year ahead. 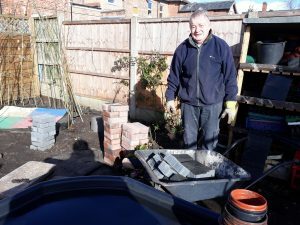 …one of the garden founder volunteers and his dad, have professionally dodged the rain and freezing conditions to get the work finished and ready in super-quick time for the up-coming events already planned for this new and exciting year ahead in the Muddy Boots garden…read more here! Broadway Social Enterprise Project, Muddy Boots, is delighted to announce it has bagged £1000 from Tesco’s Bags of Help community grant scheme. Read our November 30th Press Release here, for more information on our award. 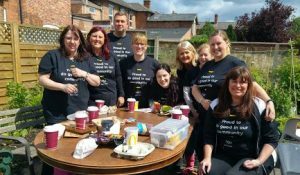 A big thank you to everyone for their support – The Muddy Boots team. Muddy Boots Buddies – kind words from absent friends! 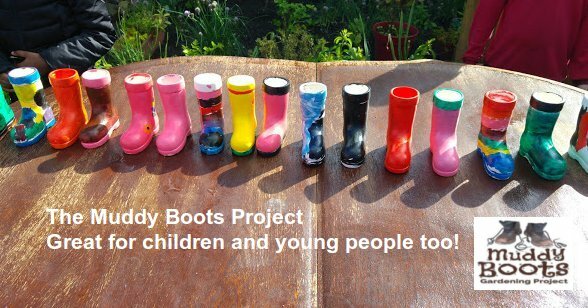 Everyone can have ‘muddy boots’! We meet every Thursday morning 9.30 to 12.00 noon behind MIND, 67 Branston Road, Burton on Trent, Staffordshire. You can get involved by sending us a short message on-line here, or ring John or Chris on 01283 564035. We all look forward to welcoming you to our project. Come and learn how to grow plants from seed or cuttings.